-Universitat Politecnica de Catalunya: BarcelonaTech, Barcelona, Spain. - Baskir State Pedagogical University, Ufa City, Russia. - Teschnische Universitat (TU), Dresden, Germany. Keep updated about our initiative. Register to our LinkedIn group - 550 registered members. This Newsletter provides insights into the activities of the THEW initiative. It is released when a new ECG database is added to the repository. It describes academic and regulatory research projects, and lists the organizations which recently joined our community. We are pleased to announce a new ECG database available to the THEW members. 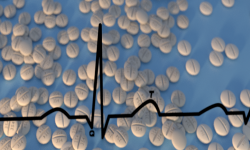 It is a database of standard 12-lead ECGs from the Arizona Center for Education and Research on Therapeutics (AZCERT), a non-profit organization that maintains the CredibleMeds.org website and its list of medications that prolong the QT interval. The Arizona Center for Education and Research on Therapeutics (AZCERT) led by Dr. Raymond Woosley developed and executed a Data Sharing Agreement with the THEW. A set of 2,423 12-lead standard ECG were recorded in a study of the gender-differences of the effect of quinidine (oral and iv) on QT prolongation. Twenty four healthy subjects including 12 women were enrolled in this study. The study demonstrated that i.v. 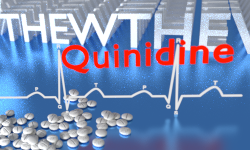 quinidine causes greater QT prolongation in women than in men at equivalent serum concentration. The study was designed as a randomized single-blinded comparison of a single dose of intravenous quinidine gluconate (4 mg/kg), oral quinidine sulfate or matching intravenous placebo (saline). The subjects remained in the supine position for the first 3 hours after drug or placebo administration and were asked to rest in the supine position at least 15 minutes before each ECG. The ECGs were digitally recorded using commercial standard bedside ECG equipment. Blood was collected through an intravenous catheter (heparin lock) in the arm opposite to the infusion at 0, 5, 10, 15, 20, 25, 30, 35, 40, 45, and 50 minutes and at 1, 1.25, 1.5, 1.75, 2, 2.5, 3, 3.5, 4, 5, 6, 7, 8, 9, 10, 11, 12 hours in relation to the dose. Blood samples were also collected as specified above on the study days during which the subjects received intravenous placebo or oral quinidine. The ECGs were performed immediately before the collection of each blood sample. The study was made possible by a grant from the FDA’s Office of Women’s Health. Importantly, this database is the first one in the THEW database to include the QT and RR interval measurements. The QT was measured in lead I, aVF, and V2 as described below. For each ECG tracing, the RR interval and QT interval were measured for the first 5 consecutive normal and technically acceptable beats, and the results were averaged to provide the RR and QT interval for the tracing. To measure QT and RR intervals, the ECG tracings were placed on a digitizing pad (SummaSketch III, Summagraphics, Seymour, Conn.) and a cross-hair type pointing device was used to mark the beginning and end of each interval. The THEW is glad to have developed a collaboration with the AZCERT for the sharing of this dataset with the worldwide scientific community. Dr. Raymond Woosley stated that “it is very gratifying that THEW will be able to make this research data from his study available to scientists with newer technologies and hypotheses to be tested.” More information about how to access to this data is available here. NIH/NHLBI funds an International research program led by the THEW initiative. The 5-year research project will evaluate the diagnostic interest of beat-to-beat QT-RR analysis in Holter recordings from patients with the inherited long QT syndrome. The NIH/NHLBI awarded a research proposal to develop a novel diagnostic technique based on beat-to-beat QT-RR dynamics computed from 24-hour Holter ECG recordings (R01HL114944-01). The novel method will be evaluated as a risk stratification tool for cardiac events in patients with the inherited long QT syndrome (LQTS). This 5-year RO1 award will fund the activities of an international team of scientists from the Hospital Bichat (Paris, France), the Fondazione Salvatore Maugeri (Pavia, Italy), and from the Heart Research Follow-up Program (Rochester, NY). If patient genotyping represents the most accurate and reliable approach to identify individuals carrying known LQTS mutation, it does not fully capture an individual risk because the repercussion of the functional defect of one or multiple mutations on the heart is poorly understood (impaired trafficking, voltage dependency, ion selectivity, and tetramerization). The most recognized markers of risk in the LQTS is the level of QTc prolongation, yet most recent clinical studies revealed that QTc prolongation, measured from resting standard ECG is an imperfect marker: 25% to 32% of the at-risk LQTS patients have a concealed form of the syndrome. Therefore, the so-called "QT-RR Dynamic Coupling in Patients with the Long QT Syndrome" study will create the largest set of 24-hour Holter recordings from genotyped LQTS patients ever gathered. The 24-Holter ECGs from 1,220 genotyped patients will be hosted in the THEW over a period of three years. The database will also include information about patients' clinical and genetic profiles for many of the patients. The history of cardiac events and the behavioral triggers (i.e. sleep, arousal, exercise, etc.) will be retrospectively evaluated. The primary objective of the project is to validate a technology to assess the level of risk and the type of risks of patients carrying an LQTS mutation that is complementary to their QT interval prolongation. "This NIH/NHLBI project is a kind of natural extension of the long-term and well-known international collaboration on LQTS (the "LQTS International Registry"). Indeed, the accurate data collection and the thorough analysis of genotype-phenotype correlation which were carried out by the International LQTS Registry over the last two decades have remarkably contributed to better patient's care. Still, knowledge gaps exist. Indeed, while we can classify the risk of events and response to therapy of our LQTS patients on the basis of the gene affected by the mutation, a large variability still exists among individuals with mutation in the same gene and even in the same region of the gene. Incomplete penetrance has been reported even for the most severe mutations. This evidence calls for more research on genetic and epigenetic modifiers. In this project, we will use advanced signal processing strategies to define the role of autonomic modifiers in determining the risk of cardiac events of LQTS patients. The project will identify novel and independent risk markers that will eventually lead to further improvement in our ability to further abate the burden of life-threatening events in this disease." The THEW has played a crucial role in this NIH submission because it is the sharing platform adopted to share the LQTS Holter recorded in this project with the worldwide scientific community. 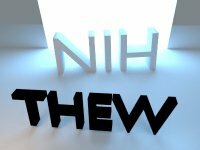 Over the years, the THEW became an efficient tool to consolidate the "Resource Sharing Plan" sections of both NIH and NSF grant submissions. 1. The FDA will host a set of meetings to discuss the improvement of specificity in proarryhthmia assessment. The FDA recently discussed with various stakeholders the possibility of replacing the thorough QT (TQT) studies . The challenge with what FDA has referred to as "hERG phobia" is one of the major challenges of current drug cardiotoxicity assessment. The incentives for discussing the replacement of TQT are three fold: 1) not all proarryhythmic risks are attributed to hERG blockade (for instance sodium channel blockers), 2) not all QT prolongation are due to hERG blockade (false positive), and 3) drugs may combine effect on multiple ion channnels, including hERG, resulting in antiarrhythmic proprieties (such as for ranolazine). There are four types of replacement strategy currently discussed at the FDA: the retrospective assessment of hERG assay, ECG recordings from early studies (phase 1), new surrogate markers such T-wave morphology, and the development of a comprehensive proarrhythmia assay. Therefore, the Agency scheduled a set of meetings for this second semester of 2013 to discuss these points. Dr. Norman Stockbridge (CDER, FDA) recently commented for the THEW Newsletter regarding these events: "Seeking better specificity in proarrhythmia assessment, FDA is investigating the possibility of replacing Thorough QT studies with a comprehensive non-clinical assay for ion channel effects of drugs. The rationale for and progress on developing such an assay will be discussed at a day-long meeting jointly hosted by FDA, ILSI-HESI, and CSRC on the White Oak campus of FDA on July 23.... There will also be one session devoted to this topic at a 3-day DIA meeting in Bethesda on October 15-17." Information about these meetings can be found at the ILSI HESI website and at the DIA website. The research work currently conducted through the THEW initiative will be presented at the DIA event scheduled for October 15-17, it will include a review of most recent work on T-wave morphology as well as a description of current experiments conducted using super-computer modeling of drug effects on the human heart and the surface ECG. This work is conducted in collaboration between the THEW, the Aab Cardiovascular Institute (Rochester, NY), and IBM T.J. Watson Research Center (Yorktown Heights, NY). 2. FDA is seeking for a Research Fellow Candidates with Bachelor's Degree in Computer Science or Biomedical Signal Processing. FDA is studying new ECG methods to better determine what kind of drug-induced QT prolongation is associated with the abnormal heart rhythm. The candidate will be responsible for developing and maintaining software tools for ECG analysis, managing data, and writing and maintaining software documentation. The candidate will work closely with more senior scientists on research analyses. The FDA is seeking a talented computer science engineer to work at the FDA Campus on an interdisciplinary team studying new electrocardiographic (ECG) device algorithms to predict which drugs cause abnormal heart rhythms and sudden death. The position is available immediately and is located at FDA headquarters at White Oak in Silver Spring, MD. Please apply by July 10, 2013 by downloading the application form from the THEW website here. John Wade, Senior Operations and Systems Analyst/Programmer Sr.
John is the newest member of the THEW team; he is a native of Rochester (N.Y) and a graduate of Rochester Institute of Technology (RIT) and SUNY Empire State College (ESC). John holds a BS in Computer Science (2004) from ESC and a MS degree in Professional Studies from RIT (2008).John came to the University of Rochester in Aug 2008 with extensive IT experience. His primary role within the THEW organization will be the daily management of the THEW server, website maintenance and development. Subscribe to this newsletter. Unsubscribe to this newsletter. Copyright (C) 2013 University of Rochester, All rights reserved.